Inuk’s release in North America! Although prepared for elementary school students, this book is not limited to grade schoolers. Folks of all ages not familiar with traditional Inuit games have something to learn here. "They came from hundreds of years ago, when Inuit lived in iglus and tents. They played the games so they would be physically strong and mentally healthy enough to survive in the -50 degree weather in which they had to go hunting, catch caribou, and so on." Games of Survival is well organized. Issaluk begins by categorizing the games into the three "disciplines": agility, strength and endurance. He describes the practical purposes of each and how the every day activities of living and enduring on the land were the inspirations for them. In each section, the games are simply described and accompanied by photographs to demonstrate the techniques. Games of Survival can be read cover to cover in less than twenty minutes if you linger to savor the text and photos. But the minimal time invested is inversely proportional to the value the book offers – a better understanding and appreciation of the extraordinarily difficult life on the land, as part of the natural world, in a challenging environment. While there is no mention of dogs or dog team travel, even folks who have experienced no more than being a first time passenger behind a team of dogs, whether in a basket sled or a traditional qamutiq, can appreciate the need for agility, strength and endurance required to keep and use a team! 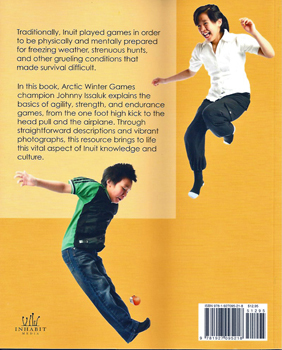 Games of Survival may not be the equivalent of the National Football League's (in the United States) "Play 60" youth exercise program, but for parents of elementary school children (and physically able kids of all ages) everywhere this book will serve to inspire physical activity as well as to teach them about another culture…a double benefit. For the rest of us years beyond the ability to do the head pull, musk ox push or Inuit high kick, this book is exercise for the mind, an opportunity for serious appreciation of the physical effort Inuit exerted in order to persevere. 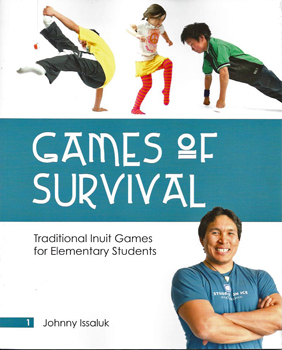 Games of Survival: Traditional Inuit Games for Elementary Students by Johnny Issaluk, ISBN 978-1-927095-21-8, is another fine offering from Inhabit Media. It is a sixty page, 8" x 10", soft cover, available from online booksellers. List price is $12.95 Canadian. To see actor, writer, champion arctic games athlete Johnny Issaluk in action performing the Inuit high kick, visit the 2014-2016 Sedna Epic Expedition.